The following review of Aleida Guevara’s talk in Brighton was written by Leo Garib for the Camden New Journal. BRIGHTON was abuzz last Sunday. From outside the TUC conference, near the seafront, London Metropolitan University students barracked union leaders, demanding strikes over education cuts and expulsions of foreign students. Among the dozens of protesters from the London Met, in Islington, were half-a-dozen working-class boys and girls, clearly dressed with the scorching hot weather in mind. They were reluctant to talk about themselves but were hoarse from letting rip at the TUC leaders. About half-a-mile up the road another more modestly dressed woman was also speaking about the future of working-class boys and girls. 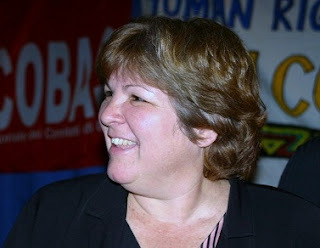 Che Guevara’s daughter, Aleida Guevara, was speaking about Cuba’s heroic struggle for survival in the face of the US blockade. Like her father, the icon of the Cuban socialist revolution, 52-year-old Aleida is a doctor. A paediatrician, a spokeswoman for Cuban women and an author, she is in Britain to mark the 14 years since five Cubans were jailed in Miami after trying to bust a terror group with US political links. Stocky, and with her father’s soft face and twinkling brown eyes, she spoke for almost two hours, pausing only to pour water for an elderly woman in the audience. She explained how the Caribbean island has to pay through the nose for powdered milk imported from as far away as New Zealand because the US blacklists firms trading with it. But Cuba has developed a health and education system that is the envy of the world, she said, sending 60,000 health workers to poorer countries – many times more than the US or any European country ¬- and offering 5,000 medical training scholarships to hard-up US students. Cuban scientists are working with Swiss experts to research vaccines against lung, breast and prostate cancer, she revealed. Mobbed by the audience afterwards, Aleida broke away to throw her arms around a young disabled boy, her eyes misting over as she beamed down at him. Aleida Guevara will speak at the House of Commons on September 17 (Grand Committee Room) at 7pm, and at a vigil outside the US Embassy in Grosvenor Square at 6pm on 18 September.